Sick of eating oranges everyday to get your male fertility boost of Vitamin C? Kiwifruit is a great source of vitamin C. Vitamin C protects sperm from oxidative damage. It will help to increase the quality of sperm in smokers and rescues sperm agglutination (when they clump together). 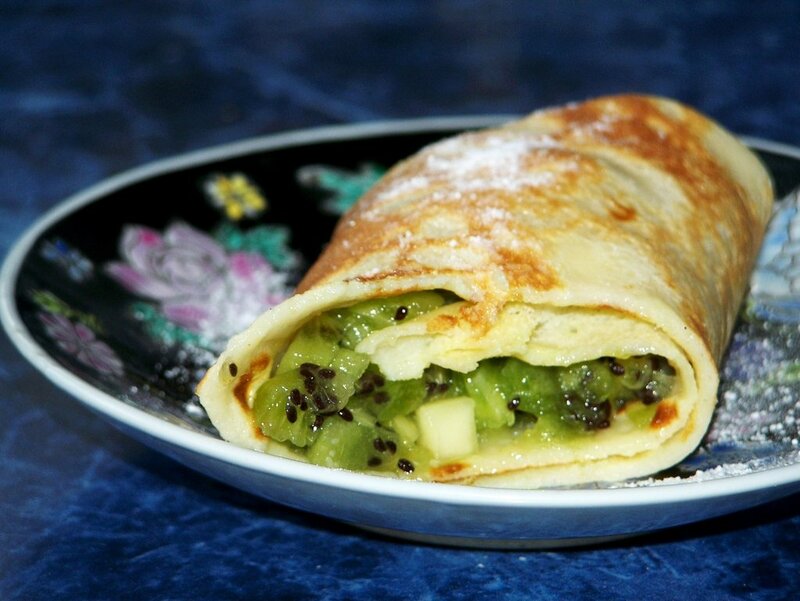 Paired with another male fertility food, banana, these healthy crepes are super easy and delicious and can be made ahead of time and assembled in a flash. 1. To make the crepes: In a large bowl, combine the flour and salt. 2. In a small bowl, beat the egg, then stir in the milk and vanilla. Pour into the flour and mix well. 3. Melt 1/2 teaspoon of the butter in an 8″ cast-iron skillet over medium heat. Pour 3 tablespoons of batter into the skillet and tilt the skillet to coat the bottom in a thin layer (if the batter seems too thick, add 1 to 2 tablespoons water). Cook the first side until nicely browned, about 2 minutes. Using a spatula, turn the crepe and cook the second side for 1 to 2 minutes (the second side will look spotty). Slide the crepe onto a plate and cover with foil to keep warm. Continue making crepes in the same fashion, rebuttering the pan after every second crepe, until all the butter and batter are used. 4. 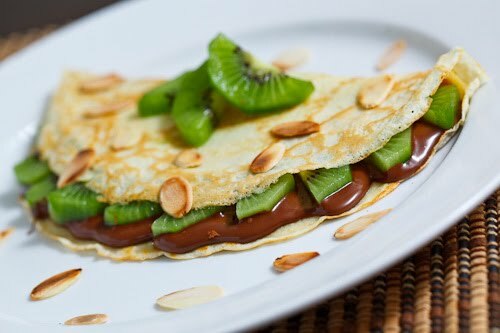 To make the filling and assemble: Place a crepe on a serving plate, attractive side down, and spread with 1 tablespoon of yogurt. Arrange 3 of the banana slices and a quarter of a kiwifruit in strips one-third of the way from one edge. Sprinkle with 1/4 teaspoon of the lime juice and a pinch of the cinnamon, and roll up. Continue assembling the remaining crepes. To make these ahead, cook the crepes, stack and cover with foil, and refrigerate or freeze. Thaw if frozen, then reheat the foil-wrapped stack on a baking sheet at 350°F until the crepes are warm and pliable, 5 to 8 minutes, or in a skillet on the stovetop. Assemble as directed. PS If you’re feeling like sweetening up these crepes, drizzle some dark chocolate over the top. Dark chocolate has been proven to boost male fertility so you don’t even have to feel naughty about it!